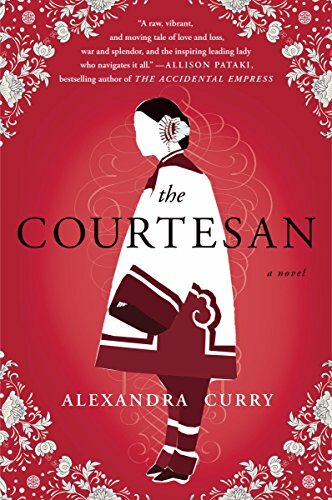 About The Courtesan: The novel is a reimagining of the life of a real historical figure, Chinese courtesan Sai Jinhua (circa 1872 – 1936). Cast out of her home after the execution of her father, the young Sin Jinhua is sold to a cruel brothel owner. She experiences in the brothel the very worst that life has to offer, yet she maintains her imaginative and bright spirit and builds a deep and sustaining friendship with a brothel maid, Suyin. Jinhua’s quick wit and kind heart catch the eye of an important official, Hong Jun, the empress Cixi’s emissary to Prussia, Austria-Hungary, Holland, and Russia, and he takes her into his home as a concubine. She finds herself on a cross-cultural journey she could never have imagined in her wildest dreams, travelling to Eastern Europe and struggling to bridge two opposing worlds. Along the way, she has an affair with a Prussian count. Torn between her Chinese roots and Western sympathies, Jinhua’s life is in peril when she returns home, where the Boxer Rebellion looms on the horizon. How did you first become interested in Sai Jinhua? When I heard Sai Jinhua’s name for the first time I was just a tourist, and definitely not yet a writer. I was in China, in Shanghai’s famous Yu Garden, and a nearby tour guide told a short and riveting story about a 19th century Chinese courtesan who lived for a time in Europe. The concubine of one of China’s early ambassadors to the West, Sai Jinhua was clever and charming and beautiful. Today her story is firmly in the realm of legend, popular culture, and, yes, history in China. How could I resist exploring her story? What were the most surprising things you learned about her as you were writing the novel? I think what surprised me most was how often Sai Jinhua’s story has been told, almost exclusively to Eastern audiences, and with what energy her life has been exploited to make various political points depending on the prevailing winds in China. She has been portrayed as wicked and heroic and charming and romantic and everything in between. Why did you tell her story through a novel, rather than through a factual biography? I never paused to ask myself! Jinhua’s life reimagined as fiction was so tantalising to me: her life as a courtesan, her travels, her love for a Prussian count, and her return to a China at war with the West were absolutely the stuff of wonderful fiction. She is one woman about whom many stories have been told, and presumably just one of them is true. (Or maybe not?) So to me the idea of creating my own version of the truth about Sai Jinhua, maybe a new way of looking from the inside at the life of this fascinating and mysterious woman, was immediately compelling. How did you research the novel from the USA? The short answer is: painstakingly. Lots of time in libraries, and sitting at my desk surrounded by piles of books. Earlier literary treatments of Sai Jinhua’s life as well as writings by scholars of Chinese literature were relatively easy to find, as were histories of the time and places in which she lived. I decided to put my fictional Jinhua into contact with several other historic characters of her era, which led me to research the empress Elisabeth of Austria, for example, and a wildly eccentric Englishman named Edmund Backhouse who made a life for himself in Peking in the twilight years of the Qing dynasty. I am a huge fan of primary sources: diaries; memoirs; photographs dating to the time. And then, for the more tangible details that are so important to historical fiction, I travelled several times to China and to Vienna looking for things like the taste of a piece of dobos torta, a layered sponge cake popular in Central Europe, or what did Jinhua see when she walked the streets of Suzhou and Vienna in the 19th century? Were you worried about exoticising “The East” for readers in the West? If so, how did you resolve your worries? There are aspects of the East that are intrinsically beautiful and exotic, and I worked hard to use but not exploit them. At the same time, there are many aspects of Chinese culture dating to Jinhua’s era that are harsh and troubling (but really interesting) from a present day perspective. My goal was to give a real sense of the way Jinhua might have lived her life, evoking not only the beautiful, the poetic, the exotic, which are all wonderful gifts that the Chinese culture offers a writer, but also the uglier, very truthful elements of her world. I worked to keep an honest and balanced perspective in the telling of Jinhua’s story. Exotic, yes, but also very real. Sai Jinhua travelled widely. So have you. In what ways, if any, did her cross-cultural journeys mirror your own? What drew me to Sai Jinhua from my very first acquaintance with her was absolutely the parallel paths that she and I travelled, she from East to West at a time when such a journey was rare, and I the other way around many decades later. For me, the experience of that first journey from Vienna to Singapore as a young girl was life-altering in every possible way. The sights, the smells, the sounds - the magic of the exotic Orient, the questions one begins to ask oneself, the notion that lives can be lived in such full and varied ways, that there is so much to understand in the world. I have ever since been fascinated by the things that happen when cultures meet (or collide) and I have complete faith in travel as a guide to a mesmerising and complicated and universally human world. And from this came my particular interest in Sai Jinhua. Do you intend the novel to comment on contemporary China? If so, what do you want to say? For me, historical fiction gives both the writer and the reader a chance to not only explore wonderful stories but also to gain a new (or deeper) frame of reference about how things connect through time. I know that in telling Sai Jinhua’s story I have benefited in this way, and I really hope that when my readers read the words "THE END" on the very last page of The Courtesan they will feel they have something to think about in the sense of why what happened then matters now - or, I suppose, maybe why it doesn’t. A historian would say that the larger dynamic between East and West that is the 19th century backdrop to Sai Jinhua’s life is a significant piece of the transition to the globalised world we live in, one in which China is a player with which to be reckoned. We in the West tend to think of China primarily in terms of the narratives of economic and military might and political repression, and the age of imperialism as it relates to China is pretty remote to the Western world view of today. A lot of the historical context of The Courtesan and leading up to the Boxer Rebellion, however, are very much a part of China’s own narrative regarding its history. They are part and parcel of what is known as “the hundred years of national humiliation,” which began with the First Opium War and ended with the establishment of the People’s Republic of China. These hundred years, during which the Middle Kingdom was more or less continuously under siege from an assortment of European nations, America, and Japan, have not been forgotten in China. They are the backdrop to what is sometimes called China’s “official nationalism”. In other words, China today is marked by things that happened when Sai Jinhua was alive, and in my view it is a good thing to know and remember history from more than one point of view. What do you hope readers take from your novel? In what ways do you hope it continues to live in their minds after they’ve finished it? I think my greatest wish would be that after reading my book, a reader would feel as I do, that history and the stories of the people who make it are endlessly fascinating. And on a more intimate level, I hope that readers will see in my version of Sai Jinhua’s life the story of a woman who struggled, who took risks and made mistakes, and learned in the end the value of true and loyal friendship. My new novel is the story of a woman who is in very many ways the mirror image of Sai Jinhua. She was the product of a time and place in which a woman’s role was very much prescribed by tradition, although she did find ways to lead a fascinating and unexpected life. Where Jinhua travelled from the East to the exotic West, my new heroine does the reverse. She is an American woman who comes of age in the 1920s, has very many choices to make for herself, and travels to exotic, free-wheeling Shanghai in the 1930s, where she leads a fascinating and unexpected life. Details: The Courtesan is published by Dutton (US edition, you may also find the UK edition available in Asia). It is new in paperback, and is available in eBook and audiobook formats. Priced in local currencies.